For already 100 years Suvretta House has perched upon a high plateau above St.Moritz. 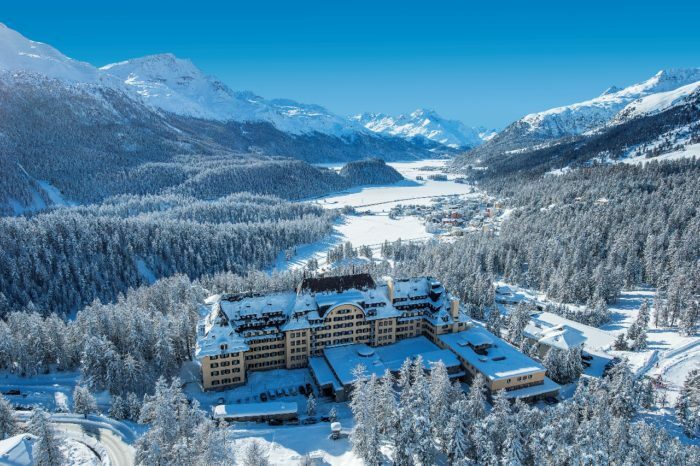 Situated at an altitude of 1850 m above sea level we fascinate our guests with a range of unique and most appealing advantages: the outstanding location, the breathtaking view of the Upper Engadin, the incomparable infrastructure, the warm hospitality and individually selected specific sports activities. For more than a quarter of a century, the St. Moritz Gourmet Festival has been bringing together selected stars and icons from kitchens all around the world. Visitors can note these nine enjoyable days in their diary for the beginning of the year: From Friday 11th to Saturday 19th January 2019, top-level guest chefs, together with the equally distinguished executive chefs at the partner hotels, will offer culinary highlights in front of the sublime backdrop of the snowclad mountain panorama of the Upper Engadin. Private lessons – come and ski with us! Open-air curling is a truly royal pleasure on our private natural ice curling rink, 1856 metres above sea level, with breathtaking views of the Engadin mountains. Beginners are always welcome to join in, so don’t hesitate to get on the ice. Starting out is child’s play on special curling sheets for hotel guests or lessons with our qualified trainer. 19./20.01.2019 curling trial course with our Curling Pro Werner Hein. Since the winter season 2016, you can enjoy the pleasure of tasting our Lady’s and Gentleman’s Gin, solely created for Suvretta House. The Suvretta House Lady’s Gin is characterized by the cornel cherry whereas the Suvretta House Gentleman’s Gin is dominated by the flavour of lime-tree blossoms. P.S. These Gins are available on-site and in our online shop. Our head patissier David Potier creates Suvretta House chocolates filled with Lady’s Gin and Gentleman’s Gin. During your stay with us, you can savour this highlight of chocolate making artistry. Hotel and Ski Pass (only valid in the winter season 2018/19! ): From 2 nights on, the ski pass for the Upper Engadin mountain transportation facilities is available at the special price of CHF 38.– per person and night.